The discussion for best burger in the city is often limited to a few heavy hitters: Father’s Office, Belcampo, Plan Check, and the old school joints like Apple Pan and Pie ‘n Burger get some well deserved nods too. But sometimes ground meat mastery is fleeting and only shows its face a few days a month. If you want to get down with a unique, damn tasty burger—or if you’re just looking for an excuse to drink some craft cocktails—head down to Hatchet Hall’s Old Man bar on Sunday and Monday nights this March. 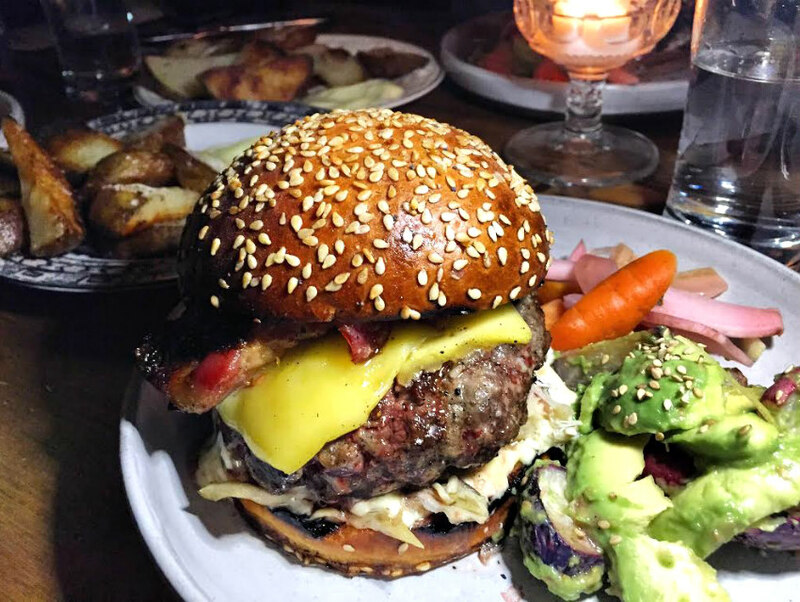 Chef David Wilcox, who previously cooked at Gjelina and Mill Valley Beer Works in the Bay, is hosting the “Burgers and Records” pop-up at the dimly lit backroom bar. For $18, you get his signature burger made from 80/20 ground BN Ranch shoulder and plate (you can only order it medium rare or medium), topped with crispy skin-on pork belly, smoked oysters, smoked oyster aioli, and melty Reading raclette straight out of Vermont. The burger will stay the same throughout the month, but the accompanying veggies will change based on whatever’s looking good at the farmers market. The night that we popped in, it was an avocado and roasted radish salad with benne seeds, and some fermenty carrot pickles. For an additional $5, you can get crispy pork fat potato wedges; they’re a sound investment. There’s only a set number of burgers going around, so get there right at 10 p.m. to make sure you’re not left out. As for chef Wilcox, he’ll be doing his share of limited-time-only dinners during March and April too. His next upcoming venture will feature a whole lamb that he killed and processed himself—he was also present for the birth—roasted on a self-built contraption. Stay tuned for more details.